Passing Storm | Flickr - Photo Sharing! tr1307, Murfomurf, and 92 other people added this photo to their favorites. Can't stop looking at this picture. Beautiful! This is probably one of the best photostreams I´ve seen here!! Really incredible. Minimalism at its finest. The texture on the sand makes this appear more like a salt pan than fields of gypsum sands. Hi, I'm an admin for a group called White Sands National Monument NM, and we'd love to have your photo added to the group. Wow, This picture is just fantastic, I have no words to really describe it. I like the blue sky against the white sand though, looks great! Brilliant photo, very serene, a beautiful depht and a wonderful sky. You are invited to add this image to An Awesome Shot! 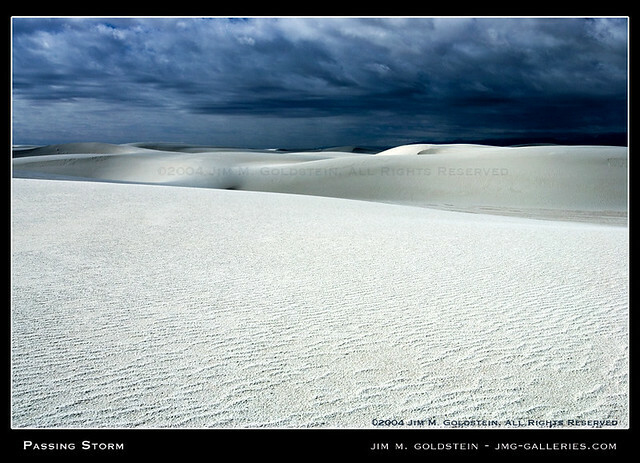 Please tag the photo with "AnAwesomeShot"
Cool contrast between the dark sky and the white gypsum sand. Una imagen fantÁStica, me encanta. Felicidades. Thank you for adding your beautiful image to !Stormy Weather!